Amritsar:- A court of additional District and session judge in Amritsar reportedly convicted Sukhdev Singh Sukha and 5 others in a case related to recovery of explosives in 2010. The court sentence does Sukhdev Singh Sukha to undergo imprisonment for 7 years under explosive act and imprisonment of five years under Arms Act and imprisonment of six years under Unlawful Activities (Prevention) Act. He was also fined Rs. 10,000 is under Exclusives Act and UAPA and Rs. 5000/- under Arms Act. 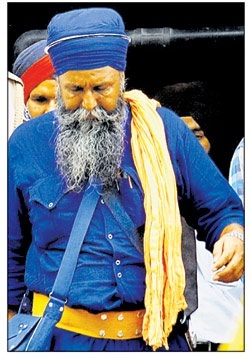 The court awarded seven-year jail to Sher Singh for possessing illegal arms and involvement in unlawful activities. The police had claimed to have seized an AK 47 rifle from him. The other four, Gurjit Singh, Gurmit Singh, Joga Singh and Gurinder Singh, have been awarded six-year imprisonment for possessing illegal arms. Breaking News :- Again Beadbi of Guru Granth Sahib Saroop at Gurdwara Sahib in Village Bath, District Tarn Taran.